SSSC is a leader in innovative radar processing techniques. 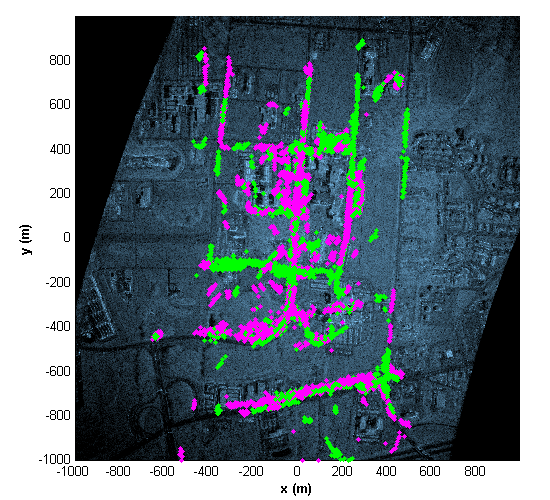 Breakthroughs in radar data processing allow users to see more from existing radar data and do more with future radar systems. Our inventive approach make contributions to a variety of common radar challenges, such as tracking moving targets, improving radar imagery, and finding buried objects. In the example below, moving target signatures are detected and placed on a Synthetic Aperture Radar (SAR) image (center), while the Aerial photo is shown on the left image. The right image is zoomed in and shows vehicles placed on the Roads in the SAR image. This processing is ideal for SWaP limited airborne platforms and is adaptable to currently fielded systems. 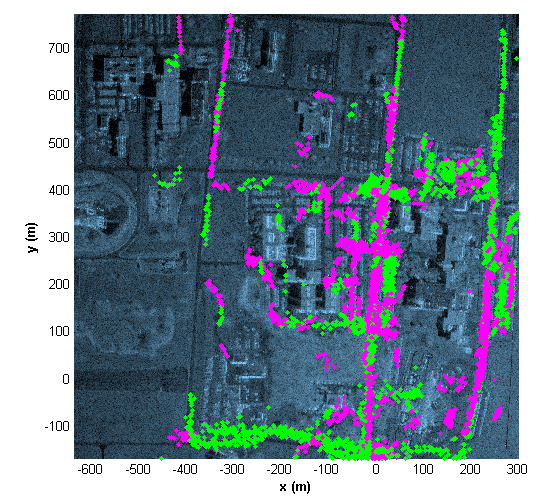 Synthetic Aperture Radar (SAR) and GMTI are performed simultaneously from the same pulses of data. GMTI detections and tracks are overlaid directly onto SAR images, thereby adding context for enhanced situational awareness. 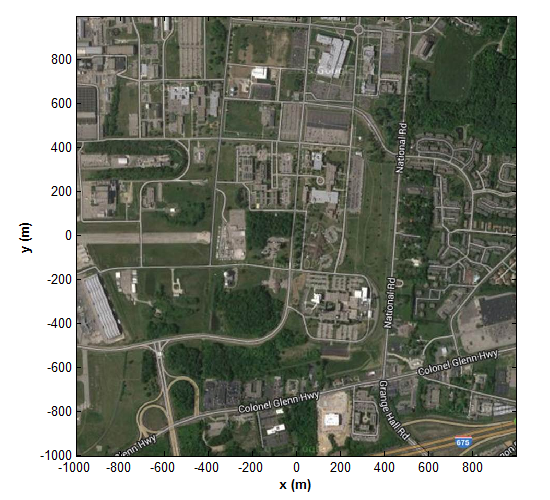 The high frame rate and the absence of coverage gaps from switching between RADAR modes will facilitate maintaining track on non-cooperative, maneuvering, and move-stop-move targets such as enemy dismounts or vehicles in traffic. 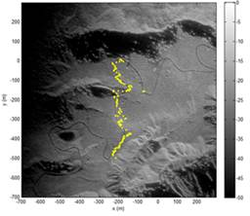 The Video SAR image obtained with this processing is illustrated where the yellow dots are GMTI detections overlaid on the SAR image of a winding mountain road. 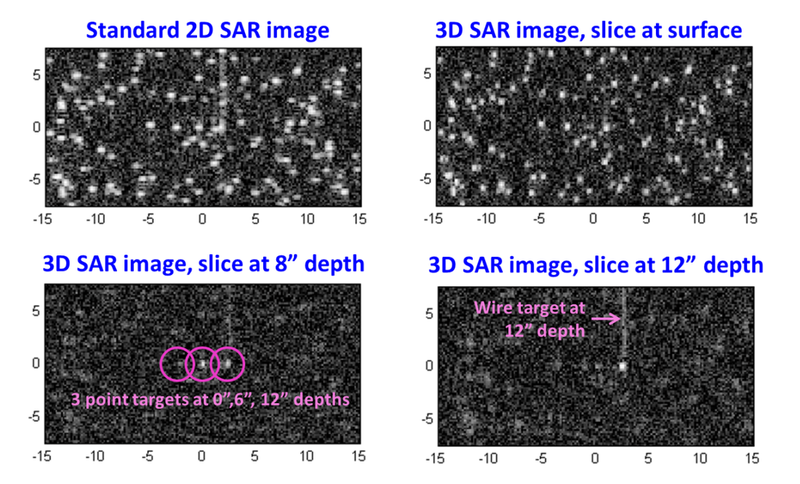 Computed results from simulated data illustrate that the interfering surface clutter makes it extremely difficult to observe buried target signatures in the standard 2D SAR image, whereas the targets are easy to detect, segregate and interpret in the individual depth-slices of the 3D SAR image.